Among thousands of academics who were dismissed and/or arrested with false charges under Turkey’s abusive anti-terror laws, a terrible ordeal of 26-year old research assistant working and studying in one of the world’s oldest technical university tells the tale. His name is Volkan Çakır, an unsuspecting victim of illegal profiling by the government. He was working as a research assistant at İstanbul Technical University, his alma mater, since Jan. 2015. He had worked for the engineering department that focused on ship building and ship engines. His university marked him as ‘terrorist’ already along with dozens of his colleagues without a trial as mass persecution that targeted real or perceived critics and opponents of country’s authoritarian regime. He was planning to start his PhD studies in Sept. 2016 but he found himself suspended for two months with the decision of University Rector Mehmet Karaca on Aug. 4, 2016. Stockholm Center for Freedom (SCF) examined the document issued by the university which suggests the management acted like a judge, jury and executioner on his case. Karaca stated that Çakır is a “national security risk” and it was decided to suspend him from the university because he was believed to connected to Gülen movement. Çakır was purged by the government decree No. 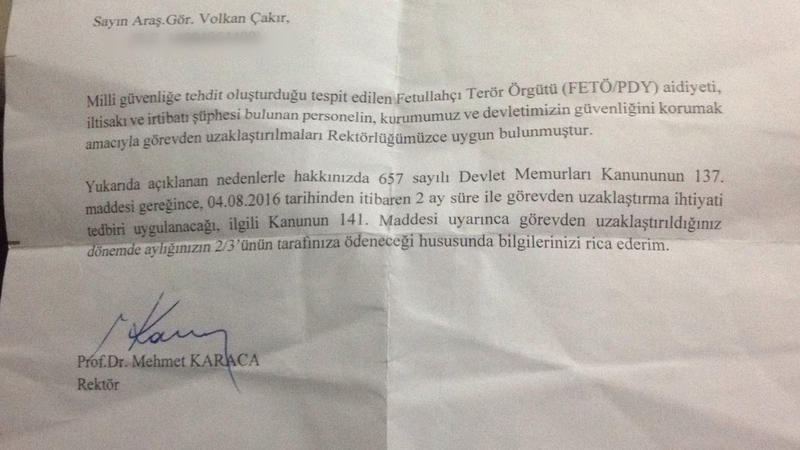 672 on Sept. 1, 2016 which dismissed thousands of academics including prominent professors from public universities without a trial and conviction. The university requested his defense after the suspension on Aug. 29, 2016, only two days before the government decree which has the effect of a law under Turkey’s renewed emergency rule, allowing the government to bypass Parliament. While the investigation was still underway, the government froze all his assets on Sept. 15, 2016. Like most dismissed public employees, Çakır was also detained on Jan. 20, 2017 on false charges of terror. He had stayed under police detention for 17 days and interrogated in the meantime. He appeared for an arraignment hearing before the judge on Feb. 7, 2017 and got formally arrested. He was transferred to notorious prison in İstanbul’s Silivri district along with 22 colleagues from the same university. SCF believes there is no evidence to support any crime, let alone terror, in this case of young research associate who was working for an engineering field in a leading Turkish university. During the interrogation, he was asked why he downloaded a smartphone application called ByLock which government claims used by Gülen movement in secret communication. He proved he never downloaded the program from an account belonged to his residential address in Aydın and provided proof that he was not even at the home on the date authorities alleged he downloaded. His smartphone had no trace of any record proving he ever downloaded the application. Tens of thousands of people in Turkey were arrested on charges of downloading this publicly available software although authorities have never produced any content from communications used by suspects that showed any criminal activity. Turkey’s National Intelligence Organization (MİT) has submitted a list of names and mobile phone numbers of 122,000 people who use ByLock but jurists believe merely downloading the application does not constitute a crime in itself, cautioning the intelligence data cannot be held up to scrutiny in the court of law unless the evidence is gathered by duly-authorized investigators. Çakır was also questioned why he attended to a prep school that provided a supplementary tutoring while he was around the age of 13 and 14. The prep school was run by a company affiliated with Gülen movement and Çakır attended there for a six month. Another evidence the prosecutor cited against him was the account he allegedly maintained at Bank Asya, a Gülen-affiliated private bank which was the largest Islamic lender in Turkey before the government takeover. Çakır said he never opened a bank account with Bank Asya but transferred money to a Bank Asya account from his bank, İşBank, to pay his monthly rents to the landlord. He rejected allegations that he belonged to Gülen movement, any association or community group and denied ever donating funds to these groups. SCF talked to relatives of Çakır and found out that his lawyers are prevented from examining evidence or case file against their clients because of secrecy imposed on the file. “Lawyers are preparing their defense based on their predictions without actually seeing the case file,” a relative told SCF. A total of 7,316 academics were dismissed as 4,070 judges and prosecutors were purged over alleged coup involvement or terrorist links. Turkish government branded Gülen movement as terrorist group and blamed the failed coup to the movement without presenting any direct evidence. Strongly denying any role in the putsch, Fethullah Gülen, whose views inspired peaceful civic group called by his followers as “Hizmet” but popularly known as Gülen movement, called for an international investigation into the coup attempt. Turkish government has never responded to this offer, instead secured a gag order on media on coup investigation. The government also prevented Gen. Chief of Staff and intelligence chief from testifying in Parliamentary commission probing coup attempt and abruptly disbanded the commission despite objections from the opposition lawmakers. Turkey’s autocratic President Recep Tayyip Erdoğan — calling the coup attempt “a gift from God” — and the government initiated an unprecedented mass purges from state institutions, aimed at clearing anybody who is believed to be not supportive of Islamist government in Turkey. Many were jailed afterwards pending trial with ambiguous charges.